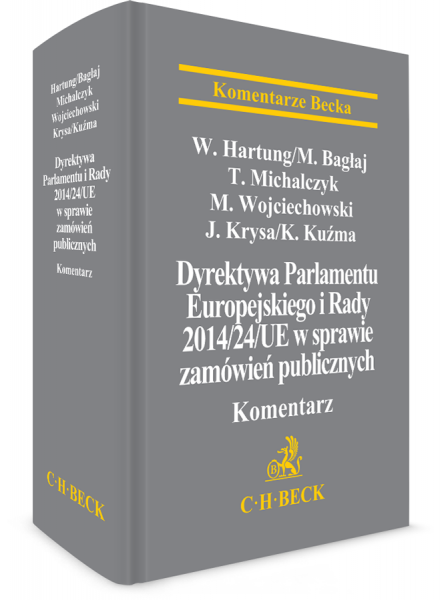 We are pleased to announce the publication of a commentary on Directive 2014/24/EU on public procurement, "Dyrektywa 2014/24/UE w sprawie zamówień publicznych. Komentarz”. The book has been written by experts in the Infrastructure and Energy Practice at Domański Zakrzewski Palinka: Katarzyna Kuźma, Partner, Wojciech Hartung, Counsel, Michał Bagłaj, Senior Associate, Tomasz Michalczyk, Senior Associate, Michał Wojciechowski, Associate and Jakub Krysa. The authors are highly experienced legal practitioners who have been advising among other things on public procurement law for many years. Although there is constant interest in the subject of public procurement, there are no other works of this kind on the Polish publishing market. This publication, written by experts at DZP, provides an unusually reader-friendly, but at the same time all-embracing, analysis of the individual provisions in Directive 2014/24/EU. We consider this commentary to provide the means for correct interpretation of the Directive, and thus might have a role to play in correct implementation of the Directive. It should be borne in mind that the deadline for implementing the Directive expires in April 2016, and correct implementation of the Directive into the Polish legal system is vital both for the way in which EU funds are used, and the way in which those funds are accounted for. The publication will be useful for people who deal with public procurement issues professionally on a daily basis, as well as authorities involved in overseeing the correct use of public funds.